LIGHTS, CAMERA, ACTION- AROUND THE WORLD! Founder Alina Morse doubles giveaway campaign. 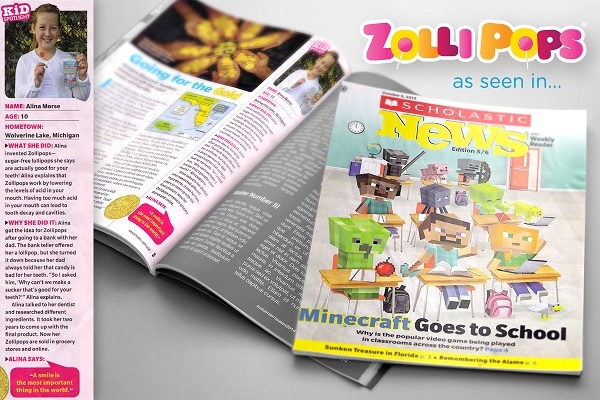 Zolli Candy is now available in 10,000 stores, thanks to the brand’s launch in 1,100 Target locations and on Target.com. Additionally, 13-year-old founder Alina Morse announced that with the retail expansion she would double her Million Smiles giveaway campaign to Two Million Smiles. Morse’s Zolli line is an all-natural, gluten-free, dairy-free, vegan and non-GMO candy, and certified sugar-free by Sugarwise. It contains xylitol and erythritol to not only provide guilt-free sweetness, but to improve oral health. By helping raise the pH (a scale used to measure acidity and alkalinity) in the mouth, Zolli Candy neutralizes acid and helps reduce the risk of tooth decay, dental caries and future development of cavities. Alina Morse is a rising confectionery star­and doing it sugar-free. IN BETWEEN ATTENDING middle school and dance practice, 13-year-old CEO Alina Morse finds time to manage six employees and prep for meetings with retailers around the globe. Morse founded her sugar-free candy company when she was 9 years old, after her dad told her she couldn’t eat candy because it was bad for her teeth. Dissatisfied with that rule, Morse-who was in elementary school at the time-wanted to find a way to make candy without that rot factor. After watching YouTube videos on how to make candy and experimenting with recipes in her kitchen, Morse now runs Zolli Candy and has the No. 1 selling sugar-free lollipop on Amazon. Morse became the youngest person ever to land on the cover of Entrepreneur, met twice with Michelle Obama in the White House, and now sells her product at major retailers like Walmart and Kroger. Morse says she has known she wanted to be a CEO since she was a toddler. She started coming up with inventions when she was just 3 years old, keeping her business concepts in an “idea binder.” The young entrepreneur settled on teeth-cleaning candy after discovering that tooth decay is one of the most common chronic conditions among children. After she finally nailed down her candy prototype, Morse persuaded her dad, Tom, to help her start a business. By that point, she had saved $3,750 from birthday and holiday gifts, and her dad matched the amount as an initial investment. Then the father and daughter went to different manufacturing plants in Michigan to produce and package the candy on a larger scale. 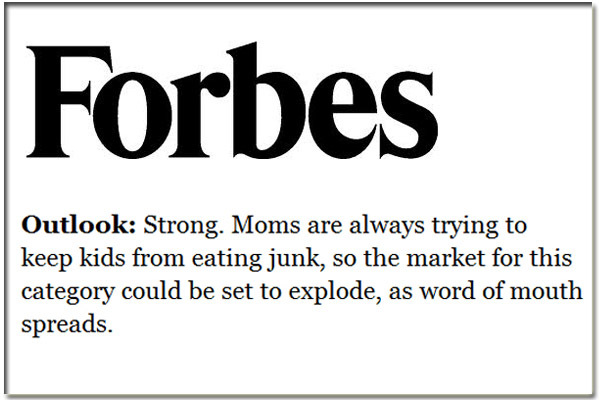 In her first year, she sold 70,000 Zollipops and was soon selling in her first major retailer: Whole Foods. Morse saw sales double year after year for four years, eventually earning $6 million in sales in 2018. She now employs six full-timers and works with contractors around the country. “We are the No. I selling sugar-free lollipop, but we want to be No. 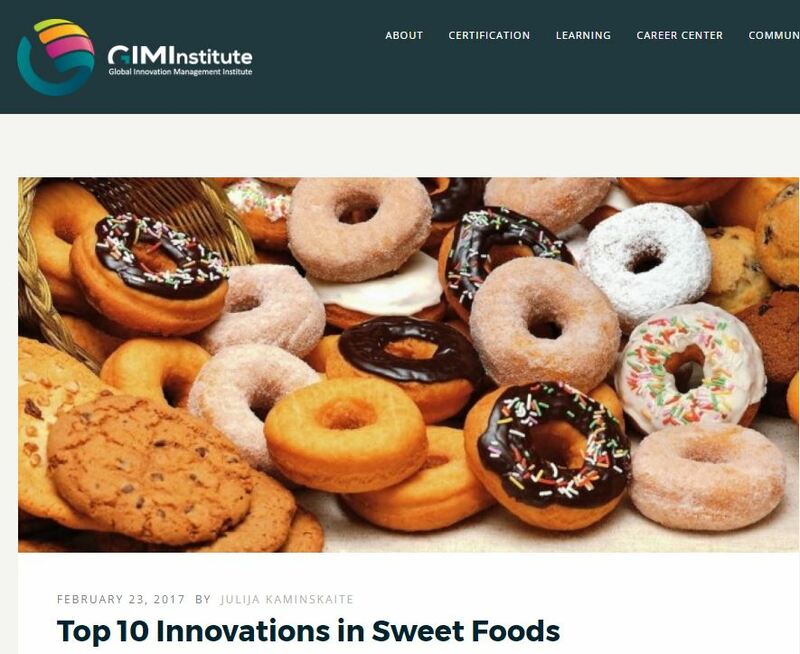 1 overall because we have a great mission, a great story, and just a great product that not only tastes great but also has health benefits,” says Morse. During her short career as a teenage chief executive, Morse has found her age to be beneficial, allowing insight into her audience. In meetings with the makers of candy titans like Tootsie Roll and Peeps, she looked around and saw mostly older men at the table-not exactly the target candy-eating demographic. Morse admits to sometimes not being taken seriously by other people owing to her age, but she doesn’t let their perceptions get to her. Morse says she’s successful not because she was born smarter than or raised differently from any of her friends-she just felt passionate about business and helping others. 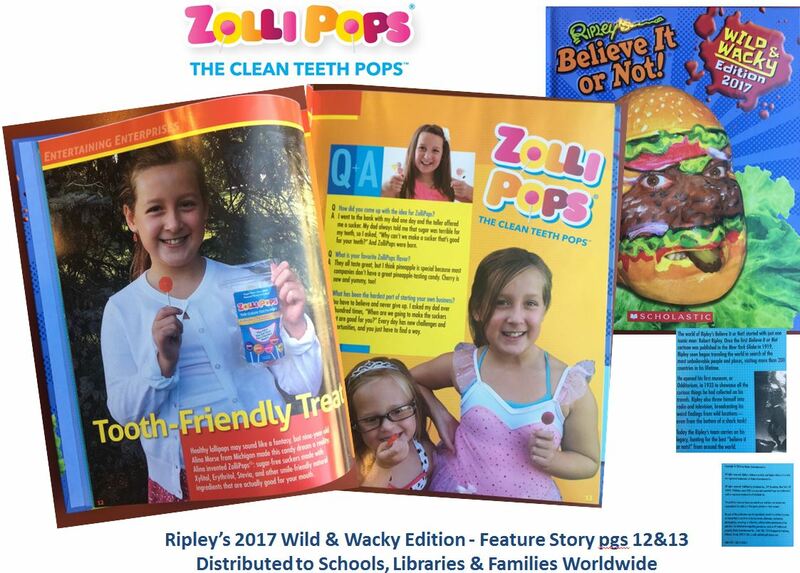 Morse donates 10% of Zollipop profits to fund oral health classes in public schools through her nonprofit, One Million Smiles, which works to reduce America’s tooth decay epidemic. She also gives lectures to encourage other kids in her community to find their passion and start their own businesses. The teenage CEO is living proof, she says, that anyone can start a company, whether they’re 9 or 90: “It doesn’t matter how old you are, where you’re from, what you’re doing,” she says. InStyle: They’re tough, outspoken, compassionate and unstoppable. Welcome to InStyle’s second Badass 50 Women list. After we launched our first Badass Women issue (starring Serena Williams) to great success last August, we decided there are just too many amazing women out there for one annual special alone. The women featured below consistently show up, speak up, and get the job done. Here, we honor these ladies for their badass contributions to science, social justice, law, politics, and many more industries. With Women’s History Month in full-swing, these women entrepreneurs share their hopes and dreams for fellow women business owners of the future. The inroads made by today’s women business owners have inspired young female entrepreneurs like 13-year-old Alina Morse. She invented Zollipops® and Zaffi® Taffy, all-natural, sugar-free candies designed to improve oral health and fight children’s tooth decay. Read all the inspiring quotes from 20 women entrepreneurs that share additional hopes and dreams for future female business leaders. In many ways, Alina Morse is a typical teenager. She juggles schoolwork with dance class and social activities. She enjoys binge-watching TV shows on Netflix, reading, and going to the movies with friends. But Alina is anything but typical. She’s the kid founder and CEO of Zollipops, a multimillion-dollar candy empire that nearly tripled in sales in 2018. So what makes her candy stand out? Her healthy lollipops and other treats feature xylitol, erythritol, stevia, and other “smile friendly” natural ingredients that are good for your teeth. The now 13-year-old recently made history as the youngest person to land the cover of Entrepreneur magazine in September 2018. And 2019 is shaping up to be just as exciting. She was featured as one of InStyle’s 50 Badass Women, alongside the likes of former first lady Michelle Obama and actress Melissa McCarthy. In addition to selling her products on LuckyVitamin.com, Alina’s sugar-free, all-natural candies are available at more than 7,500 stores domestically and also distributed in several international markets. As part of our Women in Leadership series, we recently sat down with the young entrepreneur to find out the secret ingredient to her sweet success. Coming in lollipop and taffy form, Zolli candy “reduces acidity and neutralizes your mouth’s PH levels after you eat,” which prevents cavities, thanks to an ingredient called xylitol. Target is the place to go to pick up your Zollipops and Zaffi Taffy in order to keep a smile on your face. She currently employs seven people. When she was only 7 years old, Alina Morse was incredibly ambitious — but she had one major problem. When she turned 9, Morse began “plant testing, research and more plant testing” to turn her sweet dream into a reality. She spent many months experimenting in her kitchen and also watched different candy-making videos on YouTube. 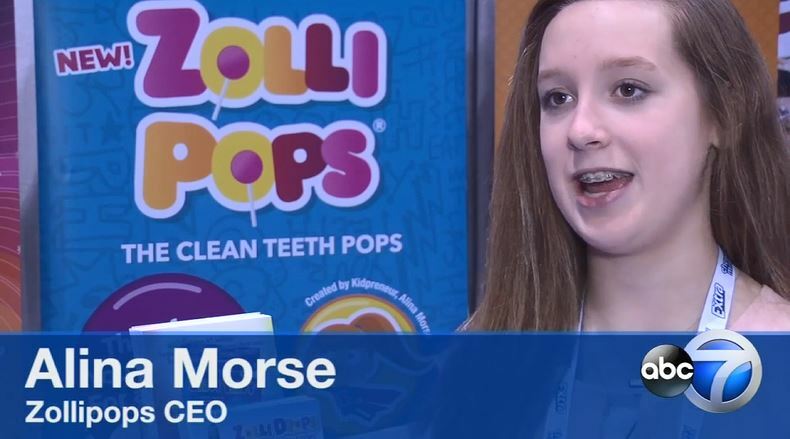 Now, at 13, she’s the CEO of a $6 million candy company that she cleverly named Zollipops. The “z” comes from the calorie-free sugar substitute, xylitol (pronounced zy-li-tol), which is used in the lollipop base. 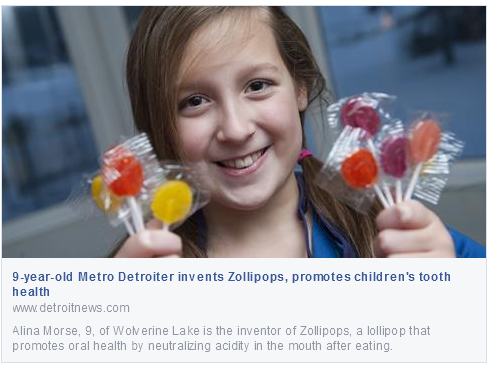 The company, rooted in Morse’s hometown of Wolverine Lake, Michigan, produces the second best-selling lollipop on Amazon. The sugar-free, gluten-free, dairy-free, vegan and non-GMO candy beats out classics like Tootsie Pops, Dum Dums and Charms Blow Pops. Morse also makes “Zolli Drops” and “Zaffi Taffy” in seven flavors, including peppermint and pineapple. Alina Morse says Good Morning, LA! Alina and TEDx Club Wow Detroit! Inspiration, innovation and perspiration- that’s what these TED folks are made of! Alina Talks Big, Cheesy, Healthy Smiles with Cheddar University! You GOUDA see Alina on Cheddar University! She’s BRIE-lliant! 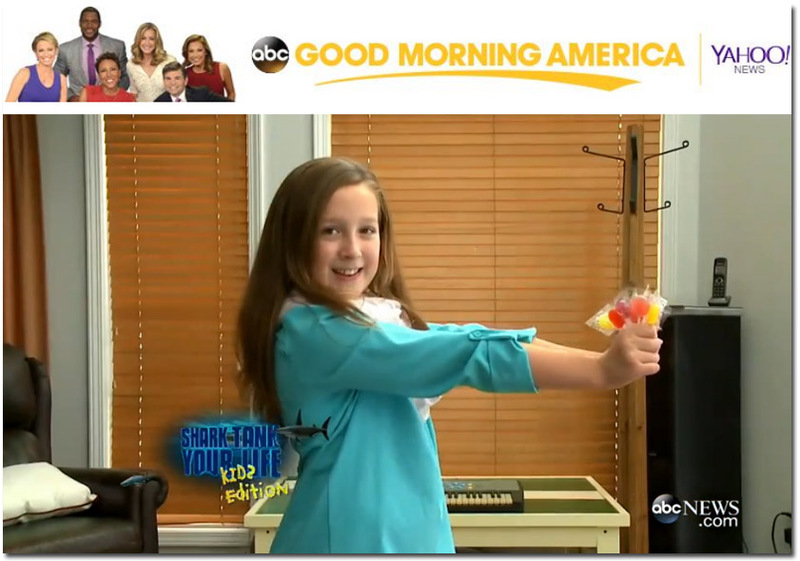 The 13-Year-Old Candy Queen on KTLA! 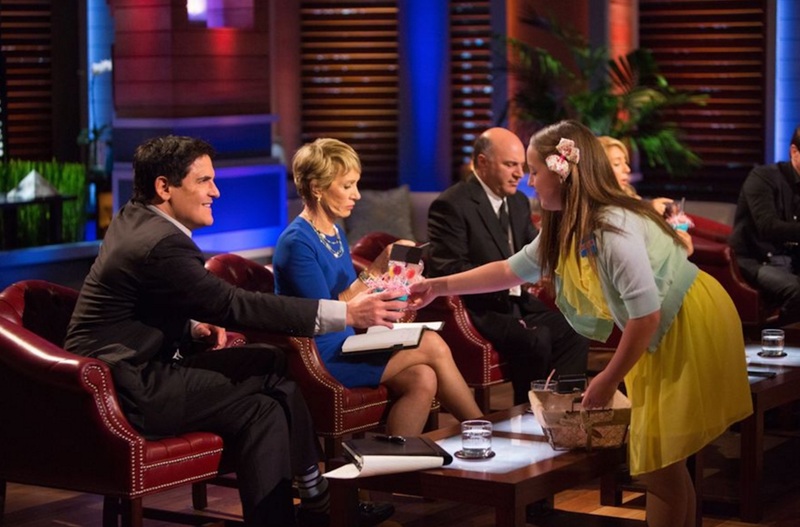 How This 13-Year-Old Entrepreneur Built a Multi-Million-Dollar Candy Company! 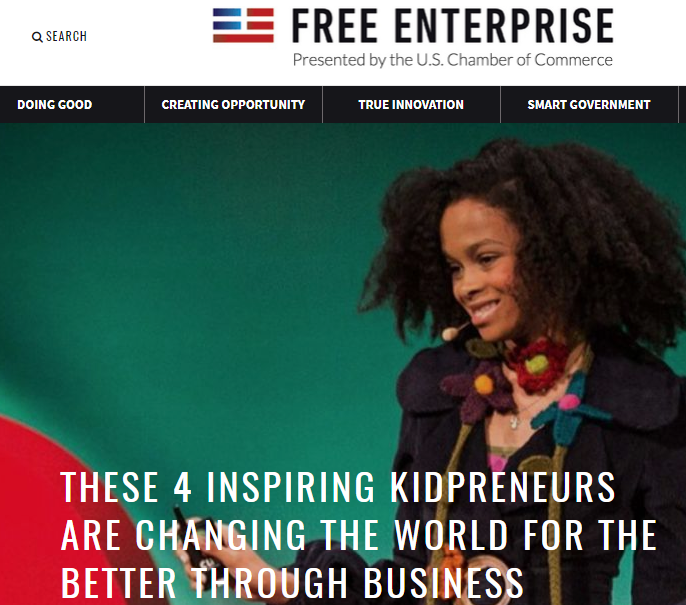 Alina became the youngest person ever featured on the cover of Entrepreneur Magazine, in the August 2018 issue dedicated to incredibly inventive and entrepreneurial kids! Way to go, Alina! 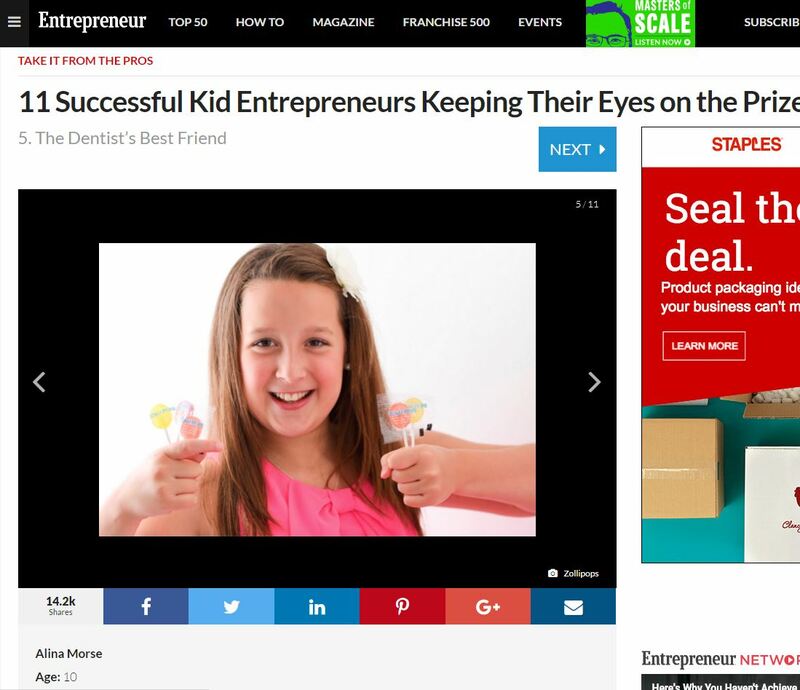 How a 13-year-old ended up on the cover of Entrepreneur! 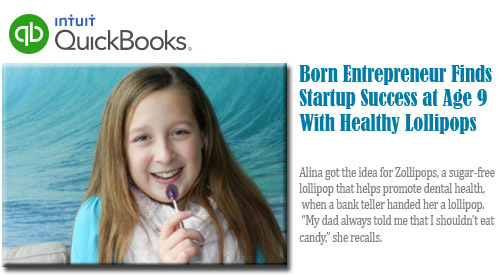 New Hope Network dives into how Alina became the youngest mogul ever on the cover of Entrepreneur Magazine! Ring in the New Year with a Perfect Smile! If Botox and black toothpaste aren’t your jam, you can always try delicious, smile-friendly candy! 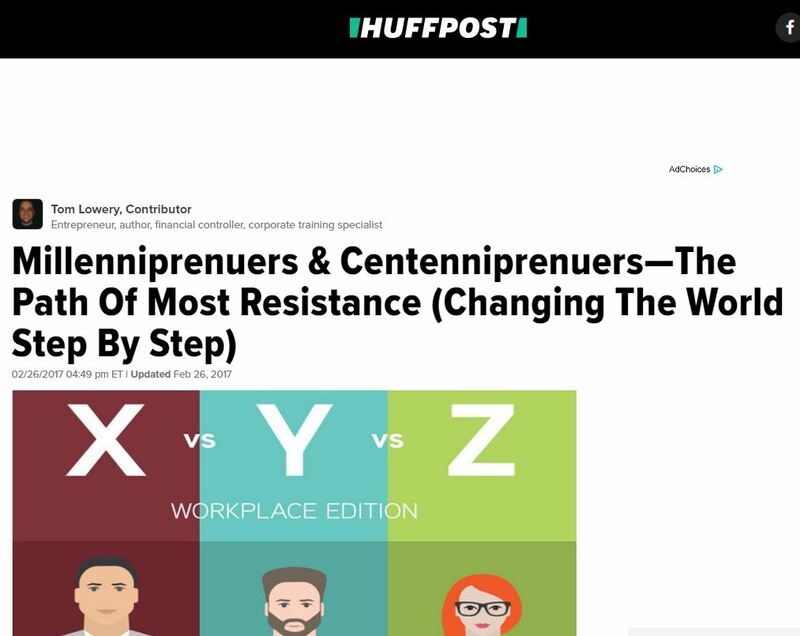 Read why 2018’s new brand of customer-centric leadership, including Zolli Candy’s Alina Morse and Tesla’s Elon Musk, are changing the entire game! Curious where Alina’s business sense comes from? Check out her abridged family history in the Polish American Journal! Big news — ONE MILLION smiles! 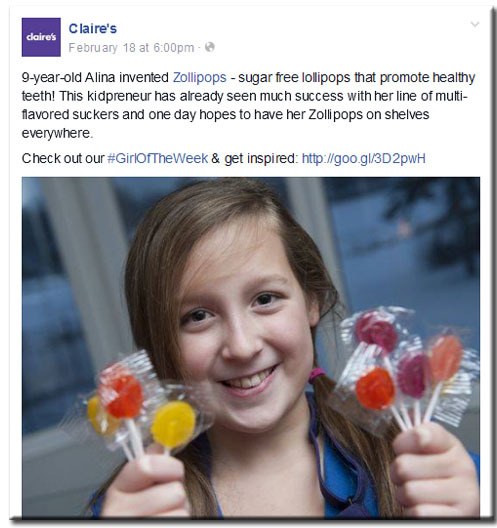 The Sweet Smiling Success Behind ZolliPops! Die Zuckerfrei Zolli Zarin spricht! 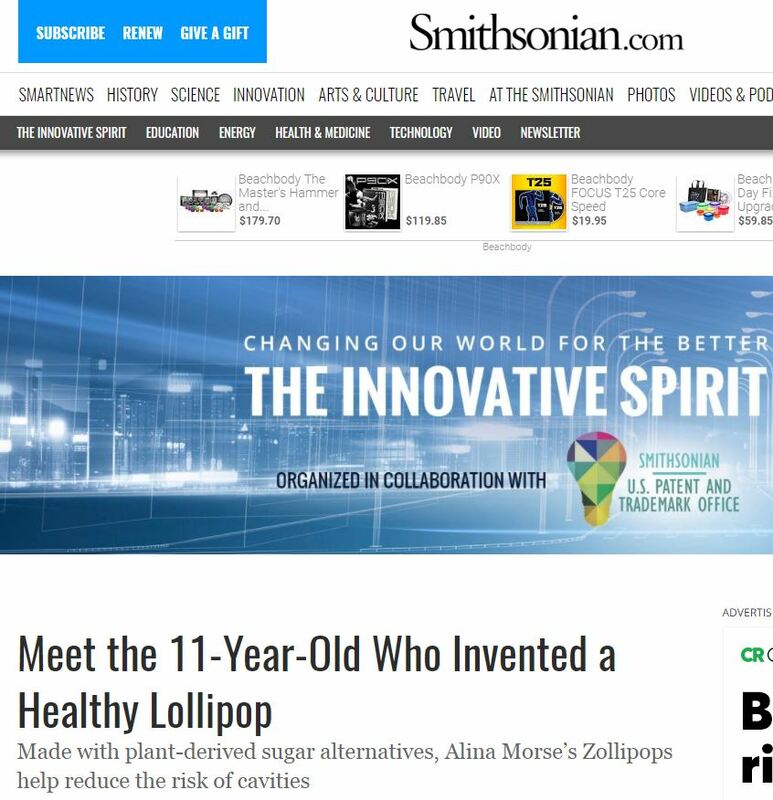 This 13-Year-Old Invented a Best-Selling Lollipop That Protects Against Cavities! Crain’s Detroit Business- 13 year old healthy candy maker makes it a family affair. The Sun – June 26, 2018 Teen Millionaire 13 year old entrepreneur. Click here to watch video! Healthy Halloween? These Lollipops Are Actually Good For Your Teeth! Another example that kids can do ANYTHING they set their mind to! 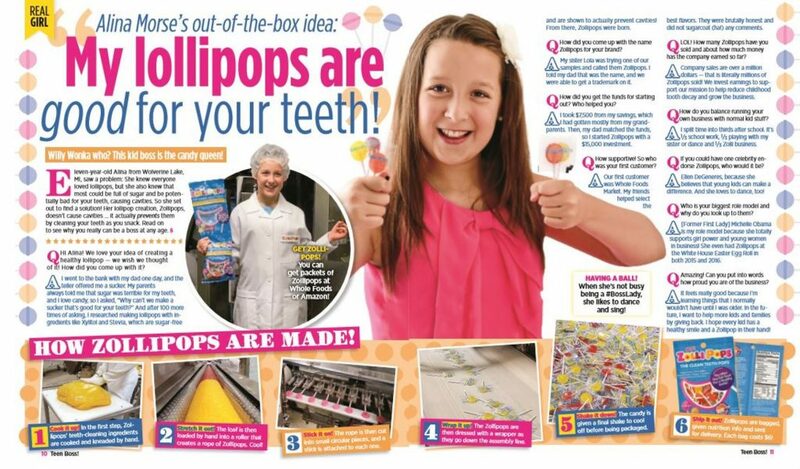 Alina Morse’s out of the box idea: My lollipops are good for your teeth! 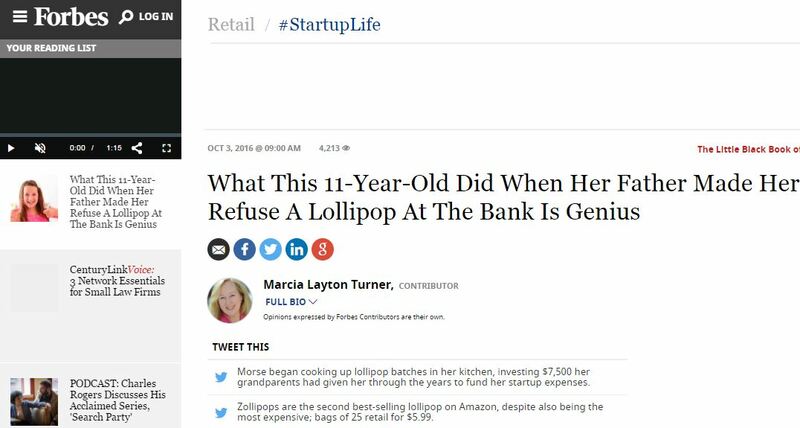 Business Women – Meet the 12 – Year Old Entrepreneur Who Has Sold $2 Million Worth of Healthy Lollipops. 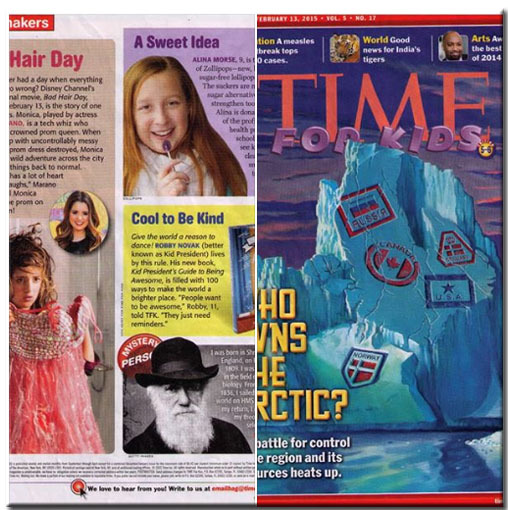 Alina Morse’s Candid Interview in her home town! Alina’s father loves the experience of working with his daughter. Lesson From a 12 Year Old CEO With On The Shelf! Listen to Alina talk about her company and how she enjoys helping others. Store Zollipops® in its resealable bag in a cool, dry place. Zollipops® may change shape and get sticky, they still taste great and will keep you smiling! Watch Alina on CNBC's On the Money!